Breast cancer accounts for over 200,000 annual cases among women in the United States, and is the second leading cause of cancer-related deaths. However, few studies have investigated the association between breast cancer subtype and survival among African-American women. We analyzed cancer-related deaths among African-American women using data obtained from the SEER database linked to the 2000 U.S. census data. 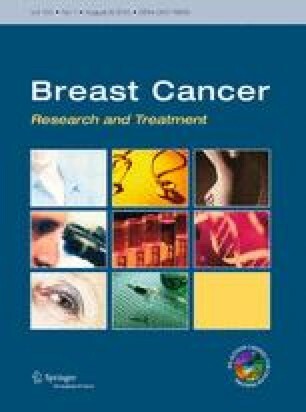 We examined distribution of baseline socio-demographic and clinical characteristics by breast cancer subtypes and used Cox proportional hazard models to determine associations between breast cancer subtypes and cancer-related mortality, adjusting for age, socio-economic status, stage at diagnosis, and treatment. Among 19,836 female breast cancer cases, 54.4 % were diagnosed with the HER2−/HR+ subtype, with the majority of those cases occurring among women ages 55 and older. However, after adjusting for age, stage, and treatment type (surgery, radiation, or no radiation and/or cancer-directed surgery), TNBC (HR 2.34; 95 % CI 1.95–2.81) and HER2+/HR− (HR 1.39, 95 % CI 1.08–1.79) cases had significantly higher hazards of cancer-related deaths compared with HER2+/HR+ cases. Adjusting for socio-economic status did not significantly alter these associations. African-American women with TNBC were more likely to have a cancer-related death than African-American women with other breast cancer subtypes. This association remained after adjustments for age, stage, treatment, and socio-economic status. Further studies are needed to identify subtype-specific risk and prognostic factors aimed at better informing prevention efforts for all women.